The POM‑946 series is an occupancy sensor module desgined to regulate the DC power supply from driver for the LED lighting. 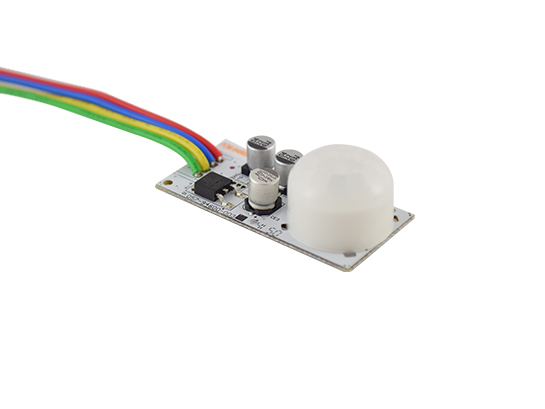 This cost effective sensor module can be easily integrated into a T8 LED tube or other LED light fixture for energy efficient occupancy sensing based LED control. The POM‑946 series is available with specific models featuring different control modes. ON-DIM The sensor will inhibit the LED lighting when ambient light level is higher than 50 lux. When ambient light level is lower than 20 lux, the sensor will automatically dim the LED at 30% to provide a safety night light, and turn on the LED to 100% when it detects occupancy. The LED will be dimmed to 30% if no movement is detected within 5 minutes. ON-DIM-OFF The sensor will inhibit the LED lighting when ambient light level is higher than 50 lux. When ambient light level is lower than 20 lux, the sensor will automatically turn on the LED to 100% when it detects occupancy. If no movement is detected within 5 minutes, the sensor will dim the LED to 30% for 10 minutes. ​The LED will be switched off if no further movement is detected within 10 minutes. ON-DIM The sensor will turn on the LED with 100% power when it detects occupancy, and dim to 30% if no movement is detected within 5 minutes. ​ON-OFF The sensor will turn on the LED with 100% power when it detects occupancy, and turn off if no movement is detected within 5 minutes.